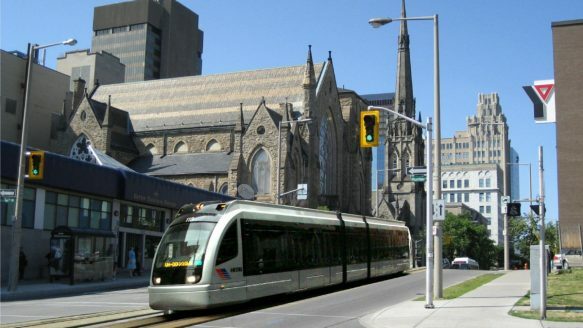 Artist’s rendition of an LRT vehicle on James Street in Hamilton. HAMILTON—The city of Hamilton will get up to $1 billion from the Ontario government for a Light Rail Transit line from McMaster University to Queenston Circle in the city’s east end. Premier Kathleen Wynne says construction on the new LRT will begin in 2019, and it will connect directly to the new West Harbour GO train station that will open this summer. The province will continue talks with the city about extending the LRT line another three kilometres east to Eastgate Square on Centennial Parkway in Stoney Creek, Wynne says. The province will also extend the GO Lakeshore West train service to a new stop at Centennial Parkway, which is expected to be completed by 2019, announced Transportation Minister Steven Del Duca. Wynne joked, “by the time all this is built, I won’t be in this job,” but later added responsible governments have to “think beyond the next election cycle” and make longterm investments. The provincial government will provide 100 per cent of the capital costs of building the new LRT, which Wynne says will reduce travel times and connect people to other transit systems. Hamilton City council will eventually have to sign off on a master agreement with Metrolinx that will spell out everything from who operates the system to what costs will be covered by the city to how a long construction period will be phased. The funding is part of the Liberal government’s planned $30 billion, 10-year plan to invest in public transit and other infrastructure projects, with just over half the money dedicated to the Toronto-to-Hamilton corridor.